Notes: Developed by Andy Burk. The above fly is his Shad pattern. Size and Silhouette are the most important aspects to create a successfull baitfish pattern. Take care to confirm the size of the natural baitfish you are fishing. Depending upon the type of baitfish you are trying to mimic, keep in mind the shape of the natural. A minnow will have a narrow and thin body but a sculpin would be short and stout. 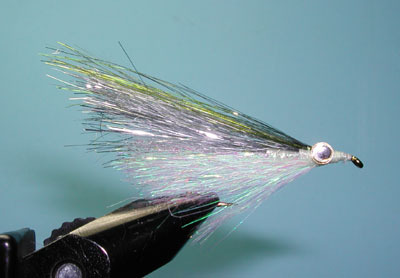 Movement and Presentation are also major factors in imitating baitfish. Bottom-dwelling baitfish patterns need to be weighted whereas shad and minnows need to be lighter to be retrieved horizontally through the water column. Minnows will often use short, darting movements or long, fast dashes. 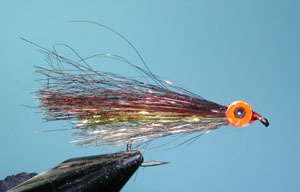 Bottom-dwelling baitfish such as sculpins and darters prefer to hide using short erratic motions. You can use larger hook sizes and utilize this pattern for salt water purposes. The pattern has been used on Tarpon in Costa Rica. Andy prefers to use Angel Hair. However, there have been a number of similar products available which would work as well such as Wing N Flash.